The best way to camouflage a home is to make it invisible. Invisi Zones 1.7.10 is a mod that adds three items to the game. The first is a block that allows us to identify the area that we want to make invisible. We also have a wand that lets you select the limits (blocks) that we become invisible, and glasses that allow us to see anything that has become invisible to the naked eye. The operation is quite simple, first we use two blocks to shape the area. Place a block in the lower end of our house and diagonally place the other block in the top of the building. Then we take the wand and make right click on the two blocks of invisibility. To remove the invisibility we take the wand and right click, holding down the Shift key on your keyboard. 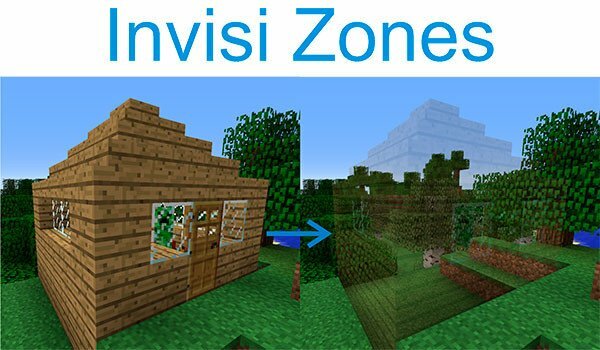 How to install Invisi Zones Mod for Minecraft 1.7.10? ¡Make your home invisible easily!